No matter how many new clothes you buy your adult baby, there are still one or two outfits where his eyes will widen when he sees daddy select them from the drawer or closet. 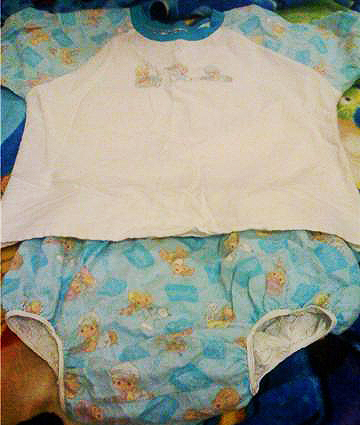 One such item in my baby closet is this beautiful two-piece outfit consisting of a soft white shirt and elastic-fitted shorts. Now, I’m not much of a photographer (maybe I’ll get better at it) but I hope you can see that this little outfit is made of the softest material you can imagine. It is not a thick material but has the feel of something more akin to a baby blanket than an adult t-shirt. Certain little boys will love the pattern. There’s no doubt it’s more babyish and not necessarily suited to older boys, but for those who are heading into or are in their ‘toddler years’ it’s a great outfit. 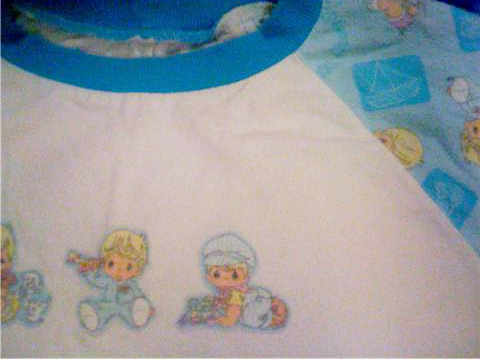 The patterned sleeves and shorts match, with little cartoons of babies and toddlers, and these characters are repeated on the front of the soft shirt. 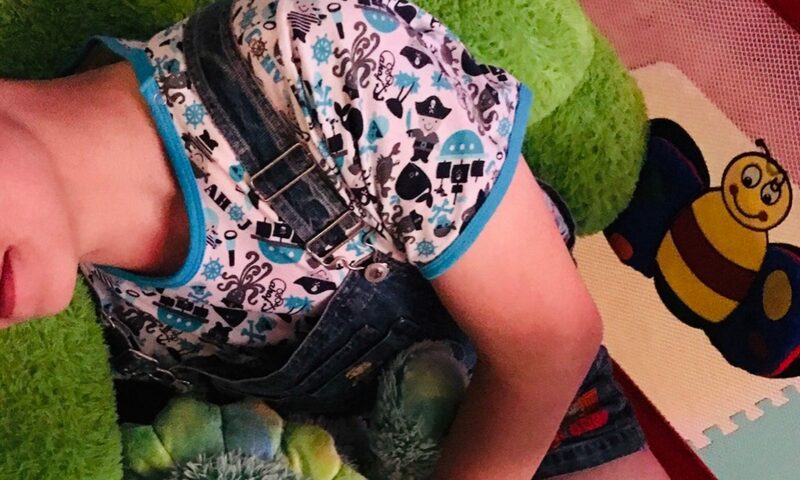 But there’s something that daddy in particular loves about this outfit: the shorts gather snugly at the legs with elastics that aren’t too tight, but even more special is the plastic lining in the shorts. This lining is made of a soft plastic and gives extra protection to your little one, helping prevent leaks and giving his diaper an extra layer of protection. 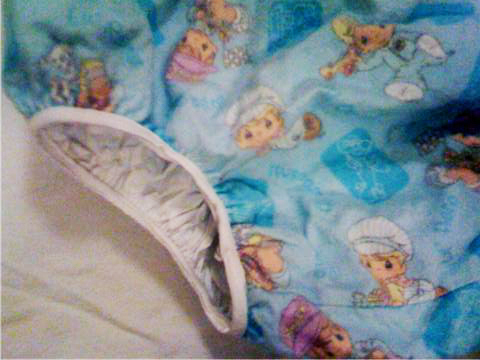 This plastic lining DOES make a fairly loud crinkling noise as your little one toddles, crawls or plays and if for some reason your little one doesn’t like the obvious sounds of diapers or plastic pants then this outfit won’t be suitable. But for daddy, the sound of the rustle and crinkle gives reassurance that his little one is nearby and wearing this cute little outfit. Very Cute and i would be happy to wear a special outfit like that while playing as daddy watches. Last week was my birthday and it was real hot outside so we planned a trip to the zoo. After breakfast I opened my presents and the last one was the one that did make my eyes widen. You would really like it. Its not just like the one in your pictures but its kind of the same cute look. Its a white short sleeve tshirt with red trim and red sleeves and a pair of shorts with thick terry cloth on the inside and a wonderful nursery rhyme pattern on the plastic outside. It has humty dumty, little boy blue, 3 little kittens and lots more all in red and blue and yellow. I also got a blue cap and red and blue socks. After my bath and a fresh diaper I put on my new outfit. It fits so nice. The shirt is soft and not too baggy and the shorts have nice snug elastic at the waist and legs like the ones in your pictures. I was so happy all day and love my birthday surprise!